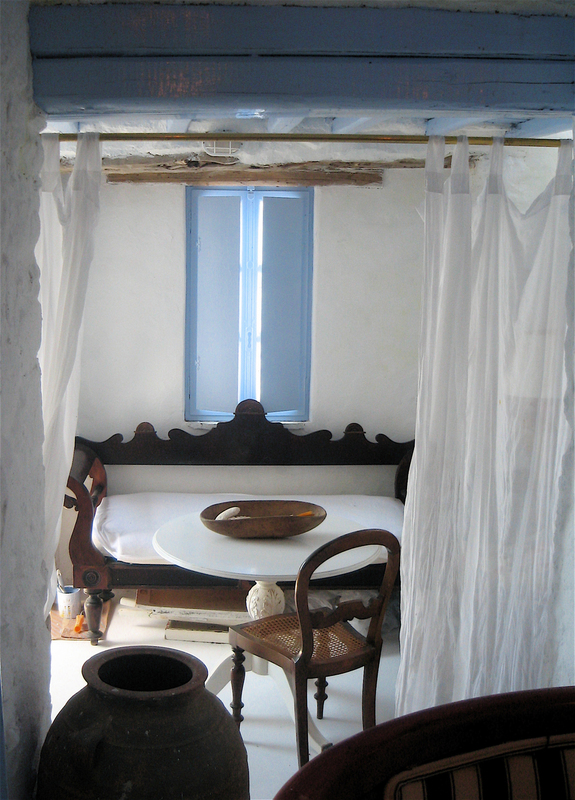 “An island villa built on the ruins of a 16th century Venetian castle in the Aegean blue”. Three ancient humble villagers’ houses were incorporated sensitively to create one, new island villa on the ruins of a 16th century Venetian castle, on the Cycladic island of Serifos in the Mediterranean. The local half a meter thick ancient rock walls are rough rendered and then contrasted by the soft, billowing form of the sheer muslin curtains and the rectilinearity of the stripy shapes which articulate the crispness of the lime-washed white walls and hewn quartzite floors, all surfaces that speak of cool, crisp, summer calm. Built entirely without the presence of roads, with craftsmen using age-old building techniques and simple donkey cart transportation, this is a feat of tradition in the modern world, still retaining its rustic charm. Home to the mythological Medusa, the interiors of this home make reference to the illustrious and mysterious history of this magical space and invite the creation of new histories in the modern age. Awash in all the aqua shades of the sea and sky, the open plan holiday home is split over a number of levels and appointed in a combination of the typical heritage style of the island, together with subtle contemporary and romantic notions of authentic Greek style.